After a short stint on the elliptical while watching Food Network (a huge perk being able to actually watch what I wanted), I went to the weight room. Again, it's really small and I can't imagine working out with more than 2 others in that space, but they have a full rack of dumbbells, an EZ Bar, a regular bar, and several benches. They do have a Smith machine that I might have to figure out how to use for squats if my gym never re-opens. 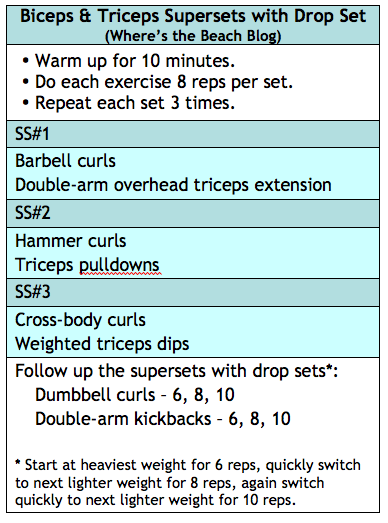 Anyway, I went with biceps and triceps today. I wanted to do something a little different. 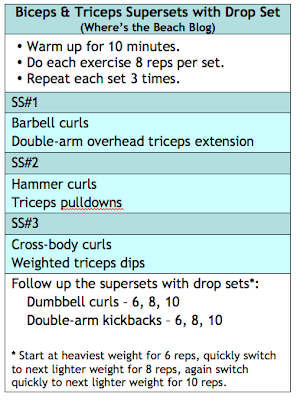 I went with supersets then added drop sets at the end of the workout for a great burn. Honestly, I wasn't feeling particularly excited to workout today. I kind of figured it'd be a struggle. But it ended up being the opposite. I felt really strong with all the weights. After my workout, I had to get to the grocery store. I kind of figured it would be a little busy as it was just after noon. So it'd be the after church crowd. But it was far busier than that. I couldn't figure out why, I was just really annoyed. I couldn't get through aisles and all that. All I wanted to do was just get home and cleaned up. I then overheard someone talking about the impending winter weather. Duh. All you have to do is say the words, "sleet, ice, snow" and everyone makes a mad dash to the store. It rarely lasts more than a day to begin with so it's not like people are going to be snowed in for weeks with no way out. It just blows my mind. Anyway, so after fighting through the crowded grocery store, I finally made it home. The next thing on tap was to continue with housework. I did some more laundry, packed up more books to store in the attic, and painted trim in the hallway, and Jason continued with his patchwork in my gym room (that I kind of need now by the way). It's going to be really cold again tonight, so I'm thinking we'll probably have chili. It's just that kind of day I think. Now onto something fun - how about a sweet (literally) giveaway for Valentine's Day? I know I've mentioned it a few times, but I am a huge fan of NuNaturals Stevia. I think it's one of the best tasting stevias you can find. I might be a bit addicted to the liquid vanilla actually. The wonderful people at NuNaturals contacted me about doing a giveaway for my blog readers. Of course I said yes to that one. Even better is that I get to choose 4 winners! I will announce the winners February 14 for Valentines Day. Winners will receive 1 50-count box of NuStevia Packets and 1 2 oz. bottle of NuNaturals Vanilla Stevia Liquid. Tell me about your most memorable Valentine's Day.